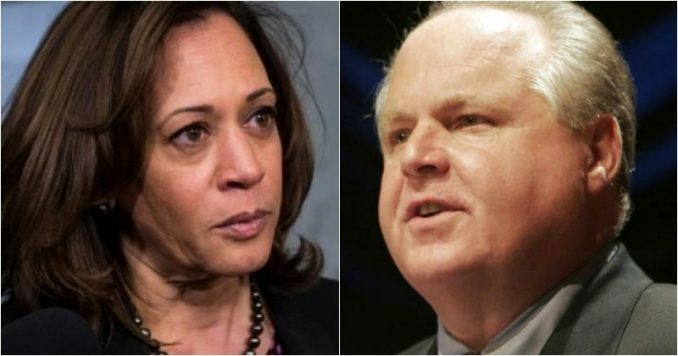 Rush Limbaugh was on fire as he reminded Americans about Barack Obama’s original plan of a single-payer health care system, also known as “Medicare for all.” Now, Kamala Harris is promising such a plan along with every other Democrat who will run for the presidency. “Obama admitted on live TV this free healthcare comes with death panels,” said Limbaugh. He went on to prove how these death panels operate. Don’t miss this. Kamala Harris is proposing Medicare for all or free healthcare for everyone in the United States — including illegal aliens. Surprisingly, many low-information voters are all in favor of this diabolical plan. That’s because it’s “free” and they are under the illusion that somehow it will make their life much easier. It’s all a huge lie. “Democratic presidential contender Sen. Kamala Harris wants to ‘move on’ from the current healthcare system in favor of a plan that would roll everyone in the U.S. onto a government plan known as ‘Medicare for all,’ doing away with private health insurance,” reports the Washington Examiner. “We all take it for granted because we grew up with it and it’s not been any big deal. It’s been the way things are,” he added. To make his point, Rush reminded us about Barack Obama’s televised town hall in 2009. The former president was faced with questions about Obamacare. Originally, Barack tried to pass the exact plan Kamala Harris and all other Democrats are now for — Medicare for all. All Americans will be required to give up our private insurance, it would exist no more. The only insurance available will be governmental-run. It would be the same plan for everyone, and that brings us to the reality of death panels. “Now, stop and think what we’re hearing here. A citizen at the White House is asking the president essentially, ‘Under your plan, can my mother continue to live and experience the joy of life? She’s full of life. Under your plan, would my mother get the pacemaker? '” said Rush. Here is how the former president answered that question concerning the elderly woman. “I don’t think that we can make judgments based on people’s spirit. That would be a pretty subjective decision to be making. I think we have to have rules that say that we are going to provide good, quality care for all people. End-of-life care is one of the most difficult sets of decisions that we’re going to have to make,” Obama said. Of course, the Democrats laugh when Americans bring up death panels. They laughed at Sarah Palin when she warned Americans about how real these death panels would become if we ever went to a single-payer system. Now, we must revisit this ghoulish situation because many Americans are duped into thinking “free” healthcare is the way to go. The hard truth is nothing is for free, and “free” healthcare is not free. In fact, it could cost you or your loved ones their life. And this is not just about the elderly. A government panel not made up of doctors but made up of government bean-counters will determine what care they will provide. For example, if you are a young woman diagnosed with ovarian cancer, you might not be provided with any treatment. Why? Ovarian cancer has a high mortality rate, so high that the government sees you as already dead. Sure, they will promise to keep you comfortable. But you won’t benefit from having treatments which could prolong your life. Is this what Americans want? I daresay no. The problem is most Americans who support Medicare for all have no idea about the reality of death panels. Please take my word as a Registered Nurse who has dealt with HMOs which were almost as bad as the scenarios I have described above. It’s time all Americans realize a vote for any Democrat in 2020, is a vote for horrible healthcare. Let’s make sure America remains a country where the right to life is sacred. The radicalized left is in charge of the Democrats, and we can’t afford to turn into the new Venezuela.